Travelling the world, killing the bad guys. With a laptop. Updating Drupal 8 sites via composer can be hard. If you are following good practices you have your website code in a git repository, and you have an environment where you can test your changes before deploying them to production. If you manage dozens of websites, you can have a hard day when you have a new security release. Enterprise hosting solutions started to handle this problem by providing better support for deployments based in composer but if you have a smaller hosting solution and access to a build server you can achieve the same with a couple of tools. Code is versioned in a git repository (bitbucket). Composer to version drupal core and contrib modules is used and mine is based in drupal composer project. Dev branch only contains composer.json and custom modules and themes. It does not have Drupal core or any contrib modules. - git config --global user.email "[email protected]"
- git config --global user.name "User Bitbucket"
All changes are pushed or merged against development branch. 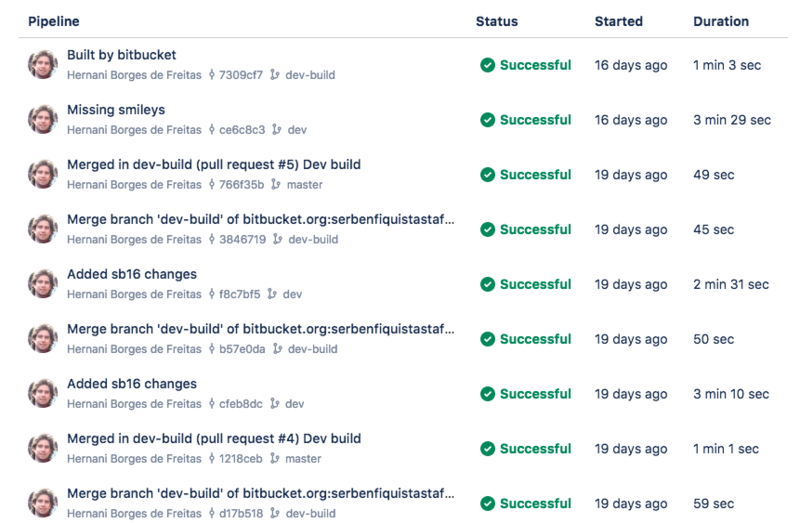 Anytime a push against development branch is done, the bitbucket pipelines plan for dev is executed to build the site using composer and push all the changes to dev-build branch. This will trigger the next pipelines job! When a push against dev-build is done, another pipelines job is executed to deploy the development branch to a development environment. // [Optional] if deploy fails automatically unlock. When I am happy with my tests on development server, I perform a pull request from dev/build branch to master which will trigger another deployment job that will deploy that branch to production and execute the exact same steps. Hope this is helpful for you, comments are welcomed ! I am interested in Open Source, Web, Software and inspiring things. I provide technical consultation and advisement for clients in several areas, being lucky to work in the biggest Drupal sites from all around the world. This blog is about what I did, what I do and what I fail to do. Ah and it is Drupal 8.